Christmas is about cherished memories and traditions, and while Canada has no unique Christmas traditions, per se, it does have a long history of events and experiences that are unique in their own way. 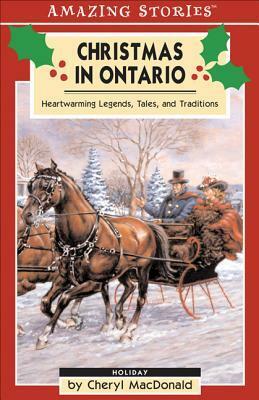 “Christmas in Ontario” by Cheryl MacDonald [Altitude Press: Amazing Stories Series, 2004] is a collection of these heart-warming stories which can be shared by the whole family. For example:“On Christmas Eve 1668, a 14-year-old girl lay fighting for her life at La Jeune Lorette, near Quebec City. Théresèse was a member of the Huron, a nation that had been pushed out of their traditional homelands near eastern Georgian Bay by the Iroquois. To comfort herself, as well as to mark the approaching holiday, she sang Jesous Ahatonhia, a carol which described the birth of Christ in a setting that closely resembled the Ontario wilderness.“While there is no definite proof, traditional accounts claim the carol was written by Father Jean de Brébeuf (1593-1649). A French missionary, Brébeuf was a skilled linguist who eventually wrote a Huron grammar and dictionary, so it is highly plausible that he translated the Christmas story into the Huron language.”Jean de Brébeuf was martyred at Ste.Marie Among the Hurons, a Jesuit mission on the shores of Georgian Bay on March 16, 1649, making Jesous Ahatonhia, or “The Huron Carol” the oldest carol written in North America. Another early recollection comes from Catharine Parr Trail who, reluctant to part with her sister at the end of Christmas Day, she accompanied her home through the woods around Peterborough, Ontario, (c. 1830s) and recorded the event as follows:”Just as we were issuing forth for our moonlight drive through the woods, our ears were saluted by a merry peal of sleigh bells, and a loud hurrah greeted our homely turn-out, as a party of lively boys and girls, crammed into a smart painted cutter, rushed past at full speed. They were returning from a Christmas merry-making at a neighbour’s house, where they too had been enjoying a happy Christmas, and long the still woods echoed with the gay tones of their voices, and the clear jingle of their merry bells, as a bend in the river-road, brought back on the breeze to our ears.”One of my favourites took place at a German prisoner of war camp, in 1917. Shortly before Christmas, the prisoners received an invitation to a Christmas party.“At the time they were skeptical—after three years surrounded by barbed wire and bayonets, they had little reason to trust their captors. But more fromcuriosity then anything else, they accepted the invitation. "When they awoke on Christmas morning, two surprises greeted them. First, all the guards were unarmed. And secondly, right in front of the guardhouse was a huge Christmas tree, dripping with tinsel and dozens of presents.The prisoners were asked to gather round the tree Then the camp commandant spoke, telling the men how much he regretted that war had taken them so far away from home and family at Christmas, and how he hoped that the gulf between the two warring nations would eventually disappear after peace.”Then a small gramophone began playing “Silent Night” and the commandant commenced to remove small presents from the tree, passing them out to each man.If you are looking to get into the Christmas spirit this year, this collection of “heartwarming legends, tales, and traditions” has the right ingredients.Anyone remember the “Cabbage-Patch Kid” craze.